Mexico’s elections on Sunday showed the growing power of the Left — and the lengths to which the ruling party will go to repress it. On Sunday, the voters of the Estado de México — the country’s most populous state, which wraps around the capital of Mexico City and is home to some sixteen million people — took to the polls to elect a new governor. In its final weeks, it became clear that the race would result in a two-way contest between Alfredo del Mazo Maza of the ruling Partido Institucional Revolucionario (PRI) and Delfina Gómez Álvarez of the leftist Movimiento de Regeneración Nacional, or Morena. In many ways, the election was a referendum on the PRI, as the state has long been a bastion of the party’s power. The PRI ran Mexico as a single-party state for more than seventy years until they lost the presidential elections in 2000. Since then, the Estado de México has taken on even more significance for the party. The PRI’s del Mazo is the son and grandson of two former governors of the state and a cousin of the current president, Enrique Peña Nieto, who was governor before running for president. Together, they represent a shadowy tendency within the party known as the Grupo Atlacamulco, named for the city from which their political machine has been run for decades. Despite declarations that Peña Nieto and del Mazo represent a “new PRI” — rather than the so-called dinosaurs of Mexico’s soft-authoritarian past, they insist — the voting process demonstrated the extent to which the party’s corrupt electoral machine remains deeply entrenched, making free and fair elections in the state incredibly difficult. I traveled to the Estado de México as part of a team of international observers with the initiative #NiUnFraudeMás, a citizens’ group devoted to preventing and uncovering fraudulent election activity in the state. My group set off early in the morning, well before the polls opened for the municipality of Ecatepec, a sprawling and largely impoverished suburb of Mexico City home to nearly 1.7 million people. By the morning of the election, #NiunFraudeMás had received dozens of denunciations of electoral irregularities. We headed to a reported “casa amiga,” where PRI operatives coordinate various kinds of voter coercion, from outright buying of votes to incentivizing individuals to bring five or ten others with them to the polls. As we gathered on a street corner at 7 AM to head to the reported site, we were tailed by young men who circled around our delegation and subjected to loud chants of “del Mazo! del Mazo!” from an apartment above. We visited a half dozen of these casas amigas in Ecatepec on Sunday morning based on tips from concerned citizens. One voter even left the line at his polling place to accompany us to a nearby site where he had witnessed illegal activity. At each site, we distributed information on the voting laws and the consequences for breaking them, and passed on the denunciation to the office of the Special Prosecutor for Electoral Crimes, who arrived with federal police to investigate reports. And at each site, we received cagey and defensive responses from the people we encountered, frequently followed by quick phone calls to the local party officials in charge, then the rapid dispersal of whoever was assembled there. Without citizen denunciations of illegal activities, they simply went on — business as usual for elections in the PRI-dominated state. Party operatives also coerced voters through arranging group transportation to polling places (which is illegal in Mexico), obliging voters to board buses and cast votes for the party, and keeping lists of those who did so. Our group saw dozens of local microbuses, their license plates removed, bringing people to polling places. In addition, the special prosecutor’s office arrested two bus drivers for illegally transporting hundreds of voters to so-called “special” polling places, where citizens can cast votes if they were away from their home districts. Toward the end of the day, we stopped at one such special polling place, outside the Torres Bicentenario museum in Toluca, where we had seen very long lines of voters earlier in the day — and that was now surrounded by large groups of federal police. The police were there, we learned, because a dispute had happened between the voters and those running the polling place. When we arrived, still an hour before polls officially closed, the voting area had been cordoned off with yellow police tape, and the official in charge was removing and counting ballots from the box. Before we arrived, the official had announced that the polling place had run out of ballots with nearly one hundred people still in line to vote. A scuffle had ensued as those waiting demanded that they be allowed to vote. In the ensuing chaos, one voter saw a pile of blank ballots set aside by the official, contrary to his assertion that they had run out. She rushed the voting table and grabbed them, showing them to the crowd. These blank ballots were proof, she alleged, that the election official had been holding ballots aside for PRI voters who were to be specially transported to the site. While arrangements like the group transportation and the casas amigas exist behind closed doors, at other sites, we found groups of people coordinating vote buying and coercion right on the street. In Ciudad Cuauhtémoc, a poor area on the outskirts of Ecatepec, we found three women with voter lists sitting outside a grocery store, organizing votes for the PRI on the sidewalk. On our way there, a taxi driver in traffic next to us warned us to be careful, saying there had been violence against opposition groups the night before. Ciudad Cuauhtémoc has grown as Ecatepec has sprawled outward, pushing up the side of a hill under the constant buzz of the high-voltage power lines that pass overhead. In recent months, it has been riddled with narco-violence. Reports say 50 percent of small businesses there have been forced to shut down after not paying protection money to drug organizations like the Zetas and, increasingly, Jalisco Nueva Generación. In addition to being a hotbed of narco activity, Ciudad Cuauhtémoc is also a stronghold of the Antorcha Campesina movement, a political organization that has been accused of violence and extortion, and that has close ties to the PRI. We arrived at one polling place across the street from a large Antorcha mural to find that, despite the fact that each party is supposed to have a representative at each polling place, there were no Morena representatives on site. This was true in many of the thousands of polling places throughout the state. Media reports indicated that numerous Morena representatives had received phone calls on the eve of the election threatening violence against them and their families if they showed up on election day. These threats were part of a larger pattern of violence throughout the state. Early Saturday morning, representatives at three local Morena offices arrived to find large piles of bloody, severed pigs’ heads outside their buildings. At midnight, state police stormed a hotel where Morena officials were staying in Tejupilco, on the pretense of looking for illegal arms. They found none. Then on Sunday, during the vote, the special prosecutor announced that they were investigating the disappearance of two local Morena officials in Metepec and Atlacamulco. In another #NiUnFraudeMás delegation, members of our group were threatened at gunpoint. These tactics of intimidation were meant to keep not just Morena officials away from polling places, but to keep voters from turning out. Throughout the day, false reports circulated on Twitter that officials had asked people to remain in their homes after an incident of violence until they were notified otherwise. The activities I personally witnessed and those reported in the media were without a doubt part of a concerted campaign to influence the outcome of the election. And since the polls closed, there have been widespread reports, including video evidence, of intentional miscounting of votes by electoral authorities. Given the violence, coercion, and corruption, then, the unofficial, preliminary results of the vote are telling: the PRI’s del Mazo currently leads Morena’s Gómez by just three percentage points. The PRI’s 33 percent of the vote represents a decline by nearly half from the last election here, where the current governor, Eruviel Ávila, garnered 65 percent of the vote six years ago. 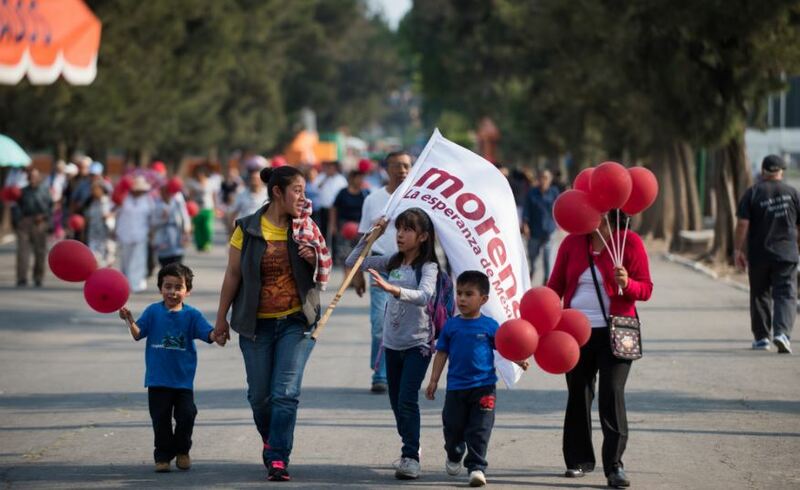 That the upstart Morena, founded as a new political party in 2014 by Andrés Manuel López Obrador, could mount serious enough of a challenge to the PRI despite such a massive campaign of voter coercion is a sign of just how badly the Mexican people want change — and a sign of the gains that the Left has made in recent years, after massive mobilizations by social movements against the current PRI administration. A year from now, the country will hold presidential elections. Morena’s López Obrador, the most visible candidate to declare so far, has been leading in early polling — despite pervasive propaganda that links Morena and López Obrador to Hugo Chávez and Nicolás Maduro, declaring that a “Venezuelan-style dictatorship” would result from his election. While official results of Sunday’s election likely won’t be announced for a few days, and a protracted court battle may be in the offing, this election makes clear that the established political machines will go to great lengths to protect a status quo of poverty, inequality, and violence. But Morena’s strong showing in this traditional seat of PRI power also demonstrates that a different Mexico is, indeed, possible. Christy Thornton is an assistant research professor in sociology and Latin American studies at Johns Hopkins University.